There are two types of people in this world: those who like Randy Newman and those who don’t. I happen to love him. Yes his songs all sound alike. Yes he’s a goofy-looking guy with an odd voice. But there’s something about the simplicity of his lyrics, his catchy tunes, and the way his style has become synonymous with Disney/Pixar. All his work with the Toy Story franchise, Monsters Inc, Cars, here in A Bug’s Life, and even in Meet the Parents; it’s all just so specific, so Newman, and so memorable. This is a film I can’t think about without hearing the music from the movie in my head, which is a good thing is this case, since I love both with equal fervor. Welcome to the world of the ant; let’s be honest, it’s not great. The residents of Ant Island lead a simple yet stressful life. They pick the food, they store the food, and they set aside extra food for the grasshoppers. Why, you ask? Because Hopper, the tyrant leader of the grass gang, demands it. He & a handful of large grasshoppers come every year to eat the ants’ offering, that’s just how it’s always been done. But when a clumsy inventor ant named Flik accidentally destroys this year’s bribe of food, the ants are put between a rock & a hard place. Hopper demands food, the colony will starve if they give up their rainy season store, and no one has any idea how to change the current situation. Except Flik. He heads out on a dangerous mission to find warrior bugs, heroic insects who can fight off the grasshoppers once and for all, creating a free ant community that will prosper forever. Everything about this movie is perfect. Like WALL-E, it has a wonderful balance of all the elements you want in a film, be it live-action or animated. The story is inventive and inspiring. The characters are wonderfully developed. The music is brilliantly used. There are heroes, villains, tough choices, brave moments, and an overall sense of morality buried beneath excellent layers of entertainment. Technically it’s a beautiful movie, with animation, color, and creativity that will blow you away. And the voices may be the best part. Foley & Louis-Dreyfus are good as the leads, but it’s the side characters who steal the show. Kevin Spacey, Richard Kind, David Hyde Pierce, Denis Leary, John Ratzenberger, Bonnie Hunt, Madeline Kahn, Phyllis Diller, Brad Garrett, Roddy McDowell, Edie McClurg, and even a young Hayden Panettiere; it would be tough to find a better voice ensemble. 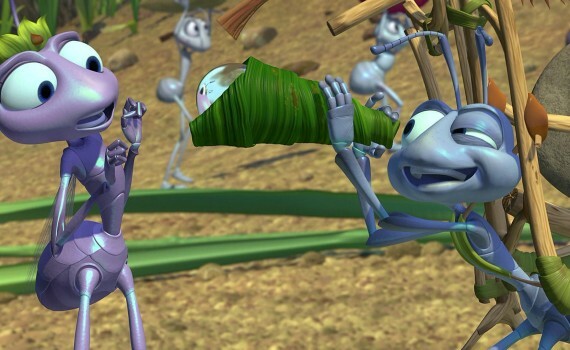 A Bug’s Life may not be the most popular Disney film, but it’s definitely one of the most underrated, a movie worth your time, and one of my personal favorites.